Many VoIP phones and services are Web Enabled meaning they can be controlled using common web technologies. 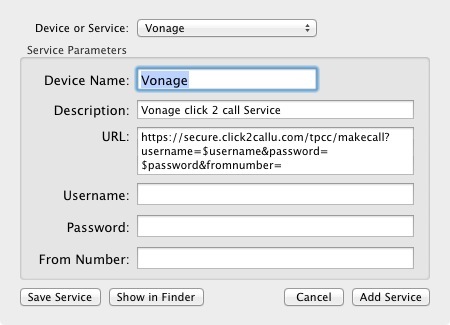 Vonage for example offers a click 2 call service that allows you to dial a call from a web browser by requesting a URL. Phone Amego allows dialing with these services by defining generic URLs with variables to be filled in as needed. To add a Generic Dial URL service, press the "+" button below the telephone devices table, select Generic Dial URL, and press Attach Device. Depending on the service you are connecting with, Phone Amego may prompt you to enter a password as needed or remember a password that was previously entered. When testing a URL, press and hold Control to have Phone Amego display the WebKit window it uses to handle the request. This makes it possible to confirm whether a URL was accepted or reported some problem. At the time of this writing, I have included examples for CallCentric, Cisco Webdialer, Push Dialer for iPhone, RingCentral (RingOut), and Yealink IP phones. If you create a URL for another popular service, I'd love to include it with Phone Amego. Once you have created a Generic Dial URL, you can select to "Dial Using" this service for other phones in the Telephone Devices table by double-clicking on a row in the table, and then selecting the corresponding service you would to dial with when that phone is selected. This allows you to dial for VoIP adaptors or other devices that don't support dialing from Phone Amego directly.